Cape Sounion (Modern Greek: Aκρωτήριο Σούνιο, transliterated Akrotírio Soúnio) is a promontory located 69 kilometres south-southeast of Athens, at the southernmost tip of the Attica peninsula in Greece. Cape Sounion is noted as the site of ruins of an ancient Greek temple of Poseidon, the god of the sea in classical mythology. The remains are perched on the headland, surrounded on three sides by the sea. The ruins bear the deeply engraved name of English Romantic poet Lord Byron (1788–1823). 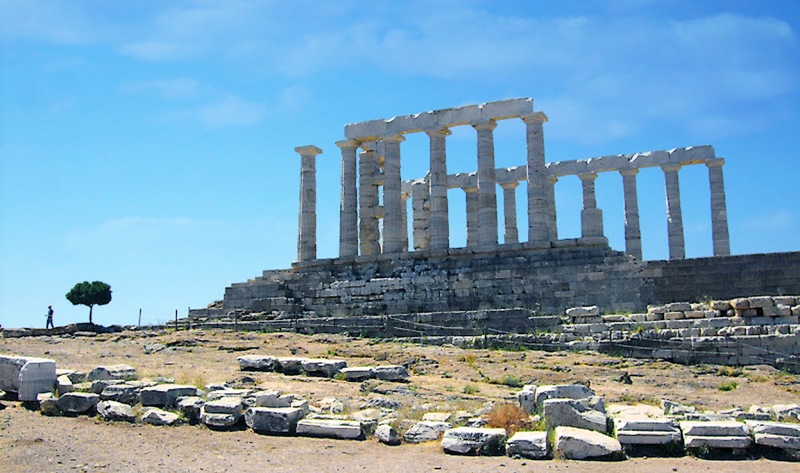 The site is a popular day-excursion for tourists from Athens, with the sunset over the Aegean Sea, as viewed from the ruins, a sought-after spectacle. Fine photo of this classic ruin. Stunning I'd love to explore there!